These are the results of the latest poll conducted by the Palestinian Center for Policy and Survey Research (PSR) in the West Bank and the Gaza Strip between 8 and 10 December 2016. Internally, the period before the poll witnessed the holding of Fatah’s Seventh Convention and the election of its Central Committee and Revolutionary Council, the dismissal of the head of the Supreme Judicial Council, and the publication of a ruling by the recently appointed Constitutional Court that grants President Abbas the authority to revoke the immunity of the members of the parliament. The period also witnessed Abbas’ participation in the funeral of the former Israeli president Shimon Peres. The Israeli settlement construction accelerated considerably during this period and the Israeli government approved legislation that would legalize the seizure by settlers of private Palestinian land for the purpose of building settlements. The period also witnessed fires breakout across Israel, Netanyahu’s invitation to Abbas to speak in front of the Israeli Knesset, Israeli defense minister Avigdor Lieberman statement that Gazans can reopen their airport and build a seaport if Hamas ceases the digging of tunnels and the launching of rockets. The Israeli Knesset debated a government bill to ban the use of loudspeakers in the mosques’ call for prayer in Israel and the occupied East Jerusalem. At the international level, Donald Trump was elected as the new president of the United States and talks continued about a possible international conference in Paris, part of the French Initiative to resolve the Palestinian-Israeli conflict. This press release addresses many of these issues and covers attitudes regarding Fatah’s convention, judicial matters, reconciliation, and others. It also covers Palestinian-Israeli issues such as the peace process, the Israeli fires, and the French Initiative. Total size of the sample is 1270 adults interviewed face to face in 127 randomly selected locations. Margin of error is 3%. level it attained three months ago and Fatah improves its standing in the West Bank. It should be pointed out that the findings show a significant rise in public perception of safety and security in the West Bank. 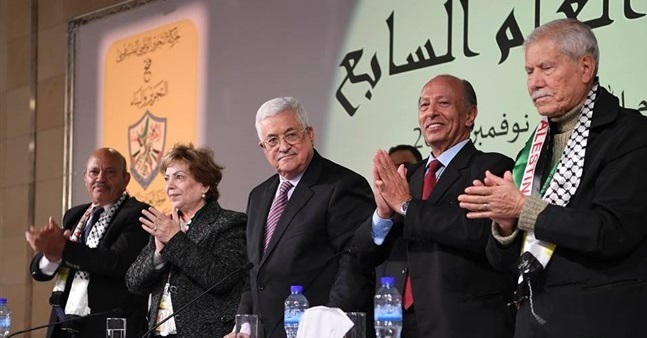 Now in the aftermath of Fatah’s Seventh Convention, findings indicate that the newly elected Fatah leadership faces a tough challenge winning the trust and confidence of the public; a majority indicates that it does not have confidence in those elected. In fact, a majority is also dissatisfied with the Convention’s decision to declare Abbas the head of Fatah for five more years and does not believe that the meeting has helped to unify the movement, improve the chances for reconciliation, or facilitate the convening of the Palestinian National Council. It should be noted however, that a majority of the likely Fatah voters does have confidence in the new leadership, is satisfied with the selection of Abbas as the head of the movement, and believes that the convention did indeed help unify Fatah ranks. Abbas faces an additional challenge as findings clearly indicate that the public rejects the recent ruling by the newly appointed Constitutional Court granting the PA president the authority to revoke the immunity of the members of the Palestinian parliament. Moreover, the public rejects Abbas’ decision to dismiss the head of the Supreme Judicial Council and believes that such dismissal is not part of the mandate of the presidency. In matters related to the Palestinian-Israeli relations, public perception that the two state solution is no longer viable increases significantly, probably due to the dramatic increase in settlement construction during the period under consideration. Moreover, findings also show an increase in the percentage of those who favor the abandonment of the Oslo agreement. More significantly however, the poll found a majority in favor of armed attacks and a return to armed intifada. During the past nine months, support for violence has been in retreat. The overwhelming majority of the public sees nothing but incitement against Arabs in Netanyahu’s claim that some of the recent fires in Israel were initiated by Palestinians. Moreover, there is almost a consensus among the public that the decision by the Israeli government to ban the use of loudspeakers in the mosques’ call for prayer is tantamount to declaring war against Islam. In the aftermath of Fatah’s Seventh Convention and the election of its new leaders, only one third of the Palestinian public expresses confidence in the ability of the new leadership to attain the goals Palestinians aspire to; 54% do not have confidence in the new leadership. Distrust in the new Fatah leadership is higher in the Gaza Strip (58%) compared to the West Bank (51%), in cities (55%) compared to villages and refugee camps (50% each), among those opposed to the peace process (73%) compared to supporters of the peace process (40%), among the religious (60%) compared to the somewhat religious (49%), among supporters of Hamas and third parties, the undecided, and those who will not participate in future elections (79%, 61%, 62%, and 58% respectively) compared to supporters of Fatah (24%), among those who work in the private sector (59%) compared to those who work in the public sector (48%), among the retired, merchants, and professionals (74%, 64%, and 62% respectively) compared to housewives, laborers, and students (45%, 54%, and 58% respectively), and among holders of two-year college and BA degrees (62% and 58% respectively) compared to illiterates and holder of the preparatory certificate (35% and 46% respectively). Similarly, only 33% of the public is satisfied with the choice made by the Seventh Convention in selecting President Abbas as head of Fatah for five more years; 57% of the public is dissatisfied with that choice. Yet, among Fatah’s likely voters, satisfaction with the selection of Abbas stands at 70%. Moreover, only 34% believe, and 52% do not believe, that the Seventh Convention has contributed to the unification of Fatah. Among Fatah’s likely voters, belief that the convention has contributed to Fatah’s unity stands at 62%. Furthermore, only a quarter (26%) believes, and 62% do not believe, that the Convention has increased the chances for reconciliation. Only one third (34%) of the public believes that success in holding the Seventh Convention will lead to further success in holding the next session of the Palestinian National Council; 48% believe it will not lead to that. Nonetheless, 42% believe, and 48% do not believe, that the selection of Abbas as head of Fatah will help consolidate Abbas’ legitimacy as the president of the PA and chairman of the PLO Executive Committee. In an election involving two candidates, Abbas and Ismail Haniyah, the latter receives 49% of the vote and the former 45%; if the two candidates are Marwan Barghouti and Haniyah, the latter receives 36% and the former 59%. 64% of the public want president Abbas to resign while 32% want him to remain in office. Three months ago, 61% said they want Abbas to resign. Demand for Abbas’ resignation increases in the Gaza Strip (72%) compared to the West Bank (59%), in refugee camps and cities (67% and 66% respectively) compared to villages (53%), among those opposed to the peace process (81%) compared to supporters of the peace process (52%), among the religious (68%) compared to the somewhat religious (61%), among supporters of Hamas and third factions (91% and 81% respectively) compared to Fatah supporters (29%), among those who work in the private sector (64%) compared to those who work in the public sector (56%), among the retired, the professionals, and students (82%, 71%, and 68% respectively) compared to housewives (62%), and among holders of BA degree (68%) compared to illiterates and holders of elementary certificate (41% and 51% respectively). If president Abbas does not nominate himself in a new election, 36% prefer to see Marwan Barghouti replacing him, while 20% prefer Ismail Haniyeh; Khalid Mishal receives 6%; Rami al Hamdallah 5%; Mohammad Dahlan 4%; Mustapha Barghouti 3%; Salam Fayyad 2%, and Saeb Erekat 1%. Level of satisfaction with the performance of president Abbas stands at 35% today compared to 37% three months ago. Level of satisfaction with Abbas stands at 38% in the West Bank and 30% in the Gaza Strip. If new presidential elections were held today and only two were nominated, Ismail Haniyeh and Mahmoud Abbas, the former would receive 49% (compared to 48% three months ago) and the latter 45% (compared to 45% three months ago). In the Gaza Strip, Abbas receives 45% of the vote (compared to 47 three months ago) and Haniyeh receive 51% (compared to 50% three months ago). In the West Bank Abbas receives 45% (compared to 43% three months ago) and Haniyeh 47% (compared to 46% three months ago). If presidential elections were between three: Mahmud Abbas, Marwan Barghouti and Ismail Haniyeh, Abbas would receive 24%, Barghouti 39% and Haniyeh 33%. If presidential elections were between two: Marwan Barghouti and Ismail Haniyeh, Barghouti receives 59% and Haniyeh 36%. If new legislative elections were held today with the participation of all factions, 70% say they would participate in such elections. Of those who would participate, 32% say they would vote for Hamas and 41% say they would vote for Fatah, 10% would vote for all other third parties combined, and 17% are undecided. Three months ago, vote for Hamas stood at 32% and Fatah at 37%. Vote for Hamas in the Gaza Strip stands today at 38% (compared to 37% three months ago) and for Fatah at 40% (compared to 39% three months ago). In the West Bank, vote for Hamas stands at 29% (compared to 29% three months ago) and Fatah at 41% (compared to 36% three months ago). Positive evaluation of conditions in the Gaza Strip stands at 11% and positive evaluation of conditions in the West Bank stands at 31%. Perception of safety and security in the Gaza Strip stands at 47%. In the West Bank perception of safety and security stands at 56%. Three months ago, perception of safety and security in the Gaza Strip stood at 48% and in the West Bank at 42%. Findings show that the percentage of Gazans who say they seek to immigrate to other countries stands at 46%; in the West Bank, the percentage stands at 24%. Three months ago 46% of Gazans and 29% of West Bankers said they seek to emigrate. We asked the public about its viewership habits in the last two months. Findings indicate that al Jazeera TV viewership is the highest, standing at 19%, followed by al Aqsa TV (at 16%), Maan TV (at 15%), Palestine TV and Filasteen al Youm (Palestine Today) at 12 % each, Al Arabiya at 6%, al Quds TV at 5%, and al Mayadeen at 3%. Perception of corruption in PA institutions stands at 76%. Moreover, only 36% of the Palestinian public say people in the West Bank can criticize the PA authority without fear. This percentage rises to 41% among West Bankers and drops to 27% among Gazans. Furthermore, 49% view the Palestinian Authority as a burden on the Palestinians while 46% view it as an asset. 60% of the public reject and 30% accept the decision of the recently-appointed Constitutional Court that gives president Abbas the authority to revoke the immunity of the members of the parliament. Rejection of the Court’s decision is higher in the Gaza Strip (64%) compared to the West Bank (57%), in cities (62%) compared to villages and refugee camps (54% and 52% respectively), among men (62%) compared to women (57%), among those who oppose the peace process (81%) compared to supporters of the peace process (48%), among the religious (65%) compared to the somewhat religious (55%), among supporters of the Hamas and third factions (85% and 77% respectively) compared to Fatah supporters (39%), among the retired, the professionals, and students (79%, 66%, and 61% respectively) compared to housewives and merchants (55% each), and among holders of BA degree (64%) compared to holders of the elementary and the preparatory certificates and the illiterates (51%, 53%, and 58% respectively). Commenting on President Abbas’ recent dismissal of the head of the Supreme Judicial Council (SJC), 57% of the public believe that the president does not have the authority to do so while 31% believe that the president has such authority. Belief that the president does not have the authority to dismiss the head of the SJC rises to 65% in the Gaza Strip and drops to 52% in the West Bank. It is also higher in cities (61%) compared to villages and refugee camps (45% and 49% respectively), among men (59%) compared to women (55%), among those who oppose the peace process (74%) compared to supporters of the peace process (46%), among the religious (65%) compared to the somewhat religious (51%), among supporters of Hamas and third factions (80% and 71% respectively) compared to Fatah supporters (38%), among the retired and the professionals (89% and 66% respectively) compared to housewives (53%), and among holders of BA degree (63%) compared to holders of the elementary certificate and the illiterates (38% and 41% respectively). Optimism about the success of reconciliation and the end of the split stands today at 35% and pessimism at 61%. Three months ago optimism stood at 31% and pessimism at 65%. 28% say they are satisfied and 63% say they are dissatisfied with the performance of the reconciliation government. In the Gaza Strip, dissatisfaction stands at 73% and in the West Bank at 56%. Belief that Hamas was responsible for hindering the functioning of the reconciliation government does not exceed 18% (9% in the West Bank and 32% in the Gaza Strip) while 34% believe that the PA and president Abbas were to blame for that and 13% blame the prime minister of the reconciliation government. 71% believe that the reconciliation government must be responsible for paying the salaries of the civilian employees of the former Hamas government in the Gaza Strip while 18% believe it is not its responsibility. Similarly, 67% believe that it is the responsibility of the reconciliation government to pay the salaries of Hamas’ former security sector and police while 21% believe it is not its responsibility. In return, 61% believe that the reconciliation government, not Hamas, should command and supervise the work of the security sector and police in the Gaza Strip while 25% believe that Hamas should continue to command and supervise this sector. Similarly, 71% support the unification of the security sectors in the West Bank and the Gaza Strip under the command and control of the reconciliation government while 22% support maintaining the status quo. A majority of 73% believes that the recent wave of fires in Israel has been the result of natural disasters; only 12% think it was initiated by Palestinians, and 9% think they were the outcome of other causes. Palestinians are divided in their position regarding the PA leadership decision to send fire fighting vehicles and men to combat the fires in Israel: 50% think it was a wrong decision and 47% think it was a right decision. Belief that it was the wrong decision is higher in the Gaza Strip (69%) compared to the West Bank (38%), among residents of refugee camps (65%) compared to residents of cities and villages (49% and 41% respectively), among women (51%) compared to men (48%), among those who oppose the peace process (64%) compared to supporters of the peace process (43%), among the religious (61%) compared to the somewhat religious (42%), among Hamas supporters (74%) compared to supporters of third factions and Fatah (46% and 31% respectively), among the married (51%) compared to non-married (46%), among those who work in the private sector (51%) compared to those who work in the public sector (45%), among holder of BA degree (58%) compared to illiterates (49%), and among refugees (56%) compared to non-refugees (45%). The overwhelming majority of the public (85%) believes that anti-Arab incitement is what lies behind Israeli Prime Minister’s claim that Palestinians have carried out the fires in Israel; only 12% believe that Netanyahu actually believes what he claims. Similarly, an overwhelming majority (87%) believes that the Israeli government decision to legislate a law that would ban the use of loudspeakers when calling for prayer at mosques is an indication of a war against Islam waged by the government while only 9% believe that the Israeli government is simply trying to protect the Israeli public. Palestinians are divided into three groups on the most effective means of building a Palestinian state next to the state of Israel: 33% believe that negotiation is the most effective; 37% think armed action is the most effective; and 24% think non-violent popular resistance is the most effective. Three months ago, 34% said armed action is the most effective means. Findings show a sharp increase in the percentage of those who believe that the two-state solution is no longer viable due to settlement expansion from 56% three months ago to 65% in this poll; today only 31% believe that it is still viable. An overwhelming majority of 80% believe that Israeli Defense Minister Avigdor Lieberman was not serious when he indicated in a press interview that Israel would allow the rebuilding of the airport and a construction of a seaport in the Gaza Strip if Hamas stopped building tunnels and launching rockets; only 13% believe he is serious. An almost three quarters (73%) believe that Abbas should reject Israeli Prime Minister’s invitation to speak in front of the Israeli Knesset; 21% believe that Abbas should accept the invitation. An overwhelming majority of the public (83%) is unhappy and 14% are happy with Abbas participation in the funeral of the former Israeli president Shimon Peres. 62% support and 30% oppose abandoning the Oslo agreement. Three months ago, 54% of the public supported the abandonment of the Oslo agreement and 36% opposed it. Support for the abandonment of the Oslo agreement stands at 60% in the West Bank and 66% in the Gaza Strip. But 64% of the public believe that despite his statement to the contrary, president Abbas is not serious about abandoning Palestinian Oslo obligations and only 29% think he is serious. Three months ago, 63% expressed the view that the president is not serious. We also asked that public if it thinks Abbas is serious when he announced during Fatah’s Seventh Convention that the PA will withdraw its recognition of Israel if it continues to reject the recognition of the Palestinian state: 30% said he is serious and 61% said he is not. We asked the public about its support for the French Initiative. The initiative we presented to respondents as one that “calls for the formation of an international support group for Palestinian-Israeli negotiations, the holding of an international peace conference that would seek a settlement based on the two-state solution and the Arab Peace Initiative in accordance with a specific time frame.” 46% of the respondents supported and 44% opposed the initiative. Three months ago, support for the French initiative stood at 53% and opposition at 38%. Opposition to the French Initiative is higher in the Gaza Strip (48%) compared to the West Bank (42%), in refugee camps (49%) compared to villages and cities (37% and 45% respectively), among those who oppose the peace process (68%) compared to supporters of the peace process (34%), among the religious (52%) compared to the somewhat religious (39%), among Hamas supporters (65%) compared to supporters of Fatah and third factions (26% and 44% respectively), among those who work in the private sector (49%) compared to those who work in the public sector (44%), among merchants and professionals (55% and 51% respectively) compared to housewives and students (42% each), and among holders of a two-year college degree and holders of BA degree (52% and 45% respectively) compared to the illiterates (30%). We also asked respondents to indicate their expectations regarding the success or failure of the French Initiative in assisting the goal of reaching Palestinian-Israeli peace. 26% expected success and 61% expected failure. In evaluating the past eight years of President Obama’s efforts to resolve the Palestinian-Israeli conflict, an overwhelming majority of 83% said that he did not make serious efforts to resolve the conflict and only 10% said he did. When asked what they want the newly elected US President Donald Trump to do, a majority of 53% of the respondents said they want him to stay out of the peace process while 30% said they want him to play a strong role in that process and 10% said they want him to play the same role the current administration plays. In the absence of peace negotiations, 74% support joining more international organizations, 62% support non-violent popular resistance, 53% support a return to an armed intifada, and 48% support the dissolution of the Palestinian Authority. Three months ago, support for a return to an armed intifada stood at 48% and 44% supported the dissolution of the PA. We asked the respondents if they wish to see the PA continue to seek support from and joint international organizations, like the UN, or to return to the bilateral negotiations with Israel: 58% said they prefer to stay with the international approach while only 24% said they prefer to return to bilateral negotiations. The percentage of those who are worried that they would be hurt by Israel or that their land would be confiscated or homes demolished stands at 73%; 27% are not worried. Furthermore, a majority of 54% believes that Israel’s long term aspiration is to annex the lands occupied in 1967 and expel their population and 28% believe that Israel wants to annex the West Bank while denying the Palestinians their rights. 16% believe that Israel’s long term aspiration is to insure its security and withdraw from all or most of the territories occupied in 1967. A majority believes that al Haram al Sharif is in grave danger: 52% believe that Israel intends to destroy al-Aqsa Mosque and the Dome of the Rock and replace them with a Jewish temple; 15% believe that it intends to divide the plateau on which the two mosques sit so that Jews would have a synagogue alongside the Muslim holy places. Only 12% believe that Israel is interested in maintaining the status quo without change. 80% say the Arab World is too preoccupied with its own concerns, internal conflicts, and the conflict with Iran and that Palestine is no longer the Arab’s principal or primary issue or cause. Only 18% think Palestine remains the Arab’s principle cause. 54% believe that there is an Arab Sunni alliance with Israel against Iran despite the continued Israeli occupation of Arab land while 31% believe that the Arabs would not ally themselves with Israel until it ends its occupation and allows the creation of a Palestinian state. An overwhelming majority of 90% believes that ISIS is a radical group that does not represent true Islam and 5% believe it does represent true Islam. 6% are not sure or do not know. In the Gaza Strip, 9% (compared to 2% in the West Bank) say ISIS represents true Islam. 82% support and 15% oppose the war waged by Arab and Western countries against ISIS. The most serious problem confronting Palestinian society today is poverty and unemployment in the eyes of 31% of the pubic; 28% say it is the continuation of occupation and settlement activities; 21% say it is the spread of corruption in public institutions; 15% say it is the siege of the Gaza Strip and the closure of its crossings; and 3% say it is the absence of national unity.